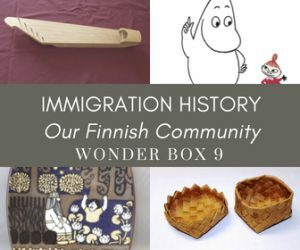 A collection of Finnish objects, children’s literature, musical instruments, and music CDs related to Finnish culture in the Monadnock Region of New Hampshire. This wonder box comes in an old suitcase, allowing kids to imagine What would my family bring to a new country if we could only pack one suitcase? Items are a mix of imports from Finland and those donated by residents of the region. Lessons and activities associated with this wonder box are listed in the teacher packet and are available online. Great for grade school and middle school lessons: Social Studies, English, Art, Music.